I had never heard of these cheeses, but I have a lifelong obsession with cheese plates (mmmmmmm), and the price seemed reasonable ($5.99), so I had to try it. In fact, the Spanish Cheese Plate didn’t even last until our picnic, because we could not resist the temptation to sample a few slices. The cheeses were REALLY good. They are all tangy, and tasted AMAZING accompanied with grapes. 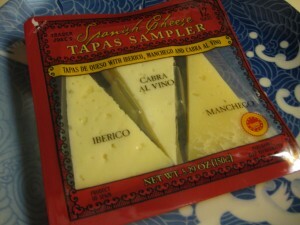 I enjoyed the Garcia Baquero cheese plate so much that I could not wait to buy another one. 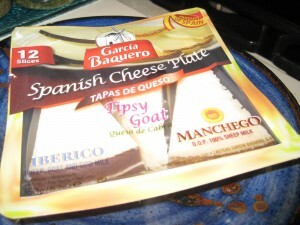 To my delight and surprise, I discovered that Trader Joe’s also sells a Spanish cheese plate, with the same three cheeses (Iberico, Manchego, and Tipsy Goat aka Cabra Al Vino), for $3.99! The Trader Joe’s version was good. I felt that the texture was a little bit more firm than with the Garcia Baquero cheeses, and the taste perhaps a little less subtle (the TJ’s Cabra Al Vino had a much stronger bite, for example), but overall, I liked it. I didn’t like it as much as the Garcia Baquero Spanish Cheese Plate, but I would buy both again.